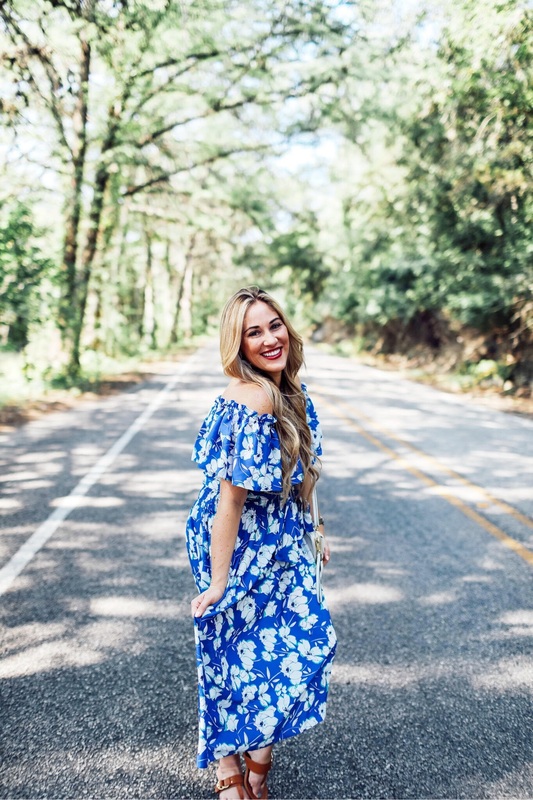 Trend Spin Linkup – Floral Dresses + Eliza J Dress Giveaway!! 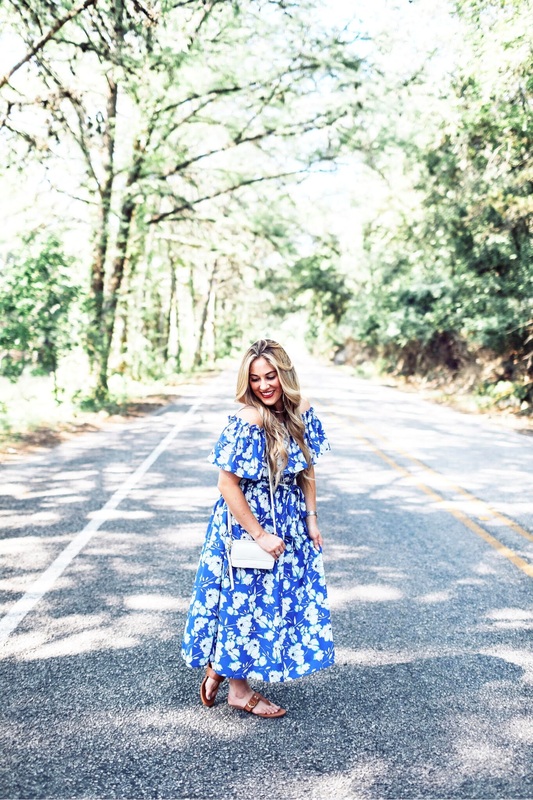 With the heat this summer, I haven’t worn many midi or maxi dresses, but when I spotted this floral print midi dress in the prettiest shade of blue, I fell in love with it. I love the off the shoulder ruffle detail and the tie waist. And it is SO flattering! 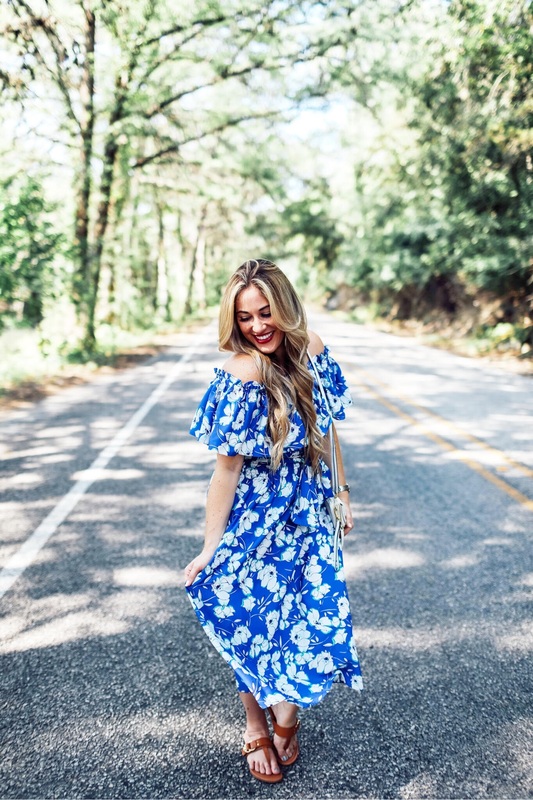 I am always a sucker for cute floral dresses, even year round! I am excited to be teaming up with Eliza J to give away this same floral print dress I’m wearing today because I know you will just love it! 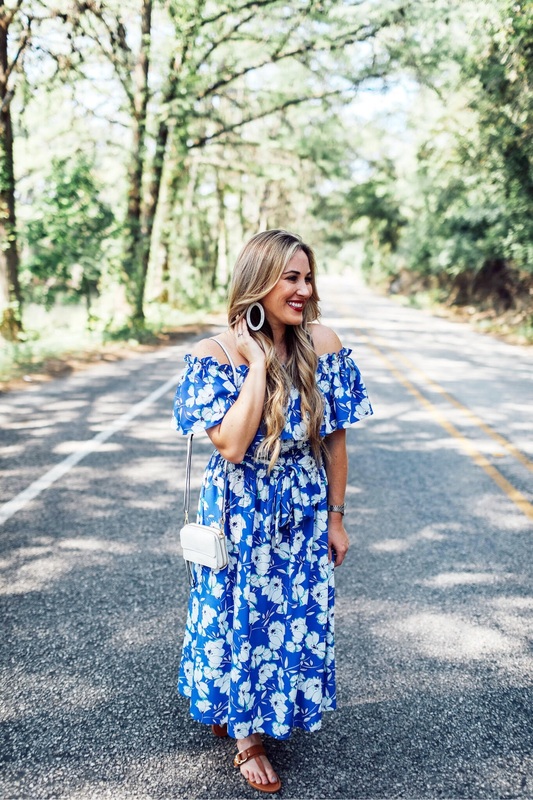 The featured bloggers are Cheryl Shops and Elegantly Dressed & Stylish and because we loved their Summer Dresses from last week’s linkup! The bodice gown is my favorite. Beautiful dress on you! That color is so pretty! SO hard to choose but I love the classic Asymmetrical Tea Length Dress! I love the Eliza J Belted Chiffon Maxi Dress! love yours and obsessed with the lace fit and flare! This dress!! My goodness, you look so beautiful, in love with the color! There are quite a few I like such as the Floral Print Faille Midi Dress. That dress is super cute! I love the blue and white print! I am LOVING this dress on you gf! Such a great color!! This dress is beautiful, and I’m loving the blue on you! You look gorgeous! First, Laura thank you for the feature! 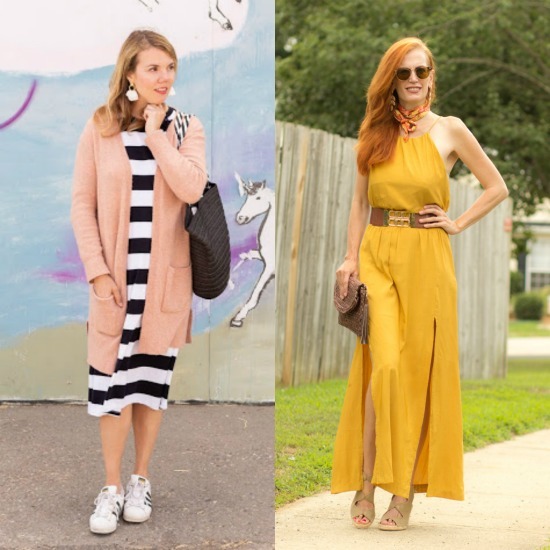 I just love mustard yellow and am looking for some fall pieces. I LOVE this dress on you and am pinning it myself as I love the style and the bold cobalt color, beautiful! Eliza J makes such pretty dresses and this one is no exception. Perfect for summer! Eliza J Gathered Lace Midi Dress is my fav! I love your pretty dress! The print is so pretty and it looks fabulous on you! Elia J has the best dresses! You look so pretty in this fun one! There are so many cute Eliza j items that it’s difficult to choose only one favorite. I really like the Mandarin Collar Shift Dress because of the unique collar (unique in Western fashion, at least). You look lovely in that floral maxi! The color is so pretty! Stunning Laura!!! Eliza J. is one of my favs! I love the sheath dress. It’s so pretty! My favorite is the Floral Print Chiffon Maxi Dress. I really like the Floral Print Faille Midi Dress. This dress is so gorgeous! I love the color and the print! I love their dresses! You can totally wear them to work or out on date night! Love the tiered ruffle fit and flare dress in that floral print! Loving the Halter Neck Cotton Maxi Dress. It’s so very pretty! The https://shop.nordstrom.com/s/eliza-j-tie-front-fit-flare-midi-dress-regular-petite/4933403?origin=keywordsearch-personalizedsort&color=green is absolutely stunning. That is my favorite in the collection. Midi dresses have become my absolute favorite!! That dress is literally summer perfection!! Everything about it is gorgeous; the color, the print, the style! I am in love! Omg love the Lace Bodice Gown! I like the belted chiffon maxi dress. I love the Lace Fit & Flare Dress. Would love to get one of these for my cruise next spring! I love the Eliza J Stripe Fit & Flare Dress! Love the Eliza J Ruffle Front Gown! I like the sheath dress. The blue dress is so cute and feminine. Love the shoulders and the way it moves! Eliza Belted Chiffon Dress in mint. That color is so refreshing! Floral Fit and Flare is adorable! I like the red Stretch Crepe Sheath Dress. Would be great for summer travel. This dress looks gorgeous on you, I love the blue!! So pretty! 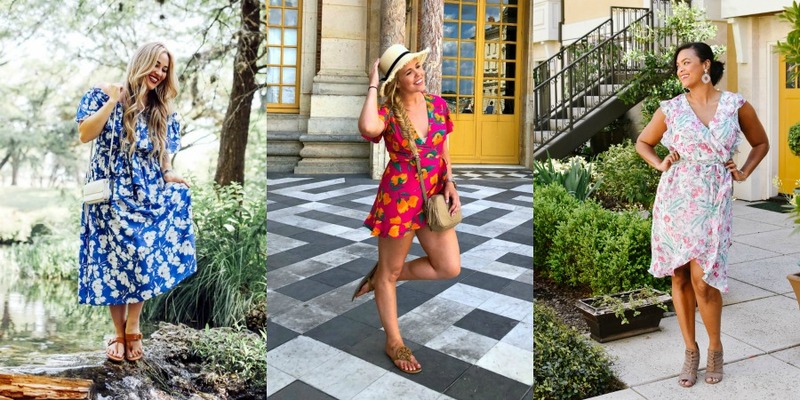 I love rompers and jumpsuits! My favorite one is the Sleeveless V-Neck Stretch Cotton Jumpsuit! The Eliza J Print Surplice Dress is really cute. I would definitely wear it! I like the faux wrap midi dress. It has a ’70s vintage feel. I love the Eliza J Off the Shoulder A-Line Dress I have an event I cant think of immediately that this would be perfect. I love the Stripe Fit & Flare Dress. Any of the floral dresses!!! Would have to say the Halter Neck Cotton Maxi Dress! I love how stylish the blue & white floral print midi dress is so comfortable as well. It reminds me of my favorite casual mumu’s of Hawaiian islands. I like the Chiffon Maxi Dress in Cobalt. Love the black & white striped dress. When I need to dress it up, I’d wear fancy flats. For a day around town, sneakers every time! Eliza J Lace Bodice Gown in navy is my favorite. I would wear the Bow Front Tie Strap Dress. So cute! I love the cap sleeve jumpsuit. I love the Eliza J Bodice Gown in blue. I absolutely love this shade of blue on you, Laura! What a perfect summer dress. ELIZA J is my favorite…. I love the Eliza J Stripe Fit & Flare Dress. I like these styles…all of them. This dress looks perfect on you! I love all the details that Eliza J puts into her dresses, they are so pretty! I LOVE them all but this one…AMAZING!! I love the Floral Print Faille Midi Dress. Those are SUPER cute! Thank you for the giveaway, Good luck everyone! I love the floral fit & flare dress. I like the fit and flare dress. Love love the dress! I think I definitely need to pick it up ? I love the Tiered Ruffle Fit & Flare Dress! I like the lace fit and flare dress! So pretty! I love the Eliza J Chiffon Ruffle gown. My 16 yr old has a formal coming up and she is drooling over some of the dresses! Her faves are the Lace Bodice Gown in the beige color and the Beaded Haltered Tiered Chiffon gown in navy. I like the Lace Fit and Flare dress for me! I just love the Eliza J stretch crepe sheath dress, but it has to be in bright red. It’s an attention getter and total sophistication! One of my favorites is the Eliza J Floral Print Midi Dress. My favorite is the Eliza J Lace Bodice Gown! Such a pretty dress, you look stunning! I love the black asymmetrical ruffle gown, it’s so elegant! I love the Eliza Jay Cap Sleeve Jumpsuit in Black. Love following you. Great taste. My favorite is the Eliza J Floral Fit & Flare Dress! Love it! Belted Chiffon Maxi Dress is really cute. I think this blue dress! It’s gorgeous and perfect color!! The classy black jumpsuit is my fave! I like this dress in blue: Ruched Sleeve Faux Wrap Dress. Colorblock Texture Knit Fit & Flare Dress! https://shop.nordstrom.com/s/eliza-j-halter-midi-dress/4630288?origin=keywordsearch-personalizedsort&color=navy This one is my favorite! Walking in Memphis is great! I just love that blue floral print midi dress! So pretty! My favorite dress is the Eliza J Belted Chiffon Maxi Dress! So pretty. There are so many pretty dresses. I really like the floral fit and flare dress. And the black jumpsuit is really cute. I sooo love the dress dear! So chic and fabulous. Such a vibrant color. I sooo love the dress dear. Cute and playful off-shoulder style, so fab on you! I love the floral printed dress! I love the faux wrap midi dress! The Eliza J Faux Wrap Midi Dress is my favorite! I also love the floral halter maxi dress. They have so many cute dresses though. Your Chiffon maxi dresses are beautiful! I love the Lace Fit & Flare Dress in Navy. So many cute ones to choose from though. 3rd time to try to comment. You look so beautiful in that dress. The color agrees with. But then again which color doesn’t. I think it’s impossible to choose one favorite. But one I would love to have is the Sleeveless V-Neck Stretch Cotton Jumpsuit. It is still hot here and will be until October or November and sometimes December so I could get plenty of wear out of it. I love the Belted Chiffon Maxi Dress in Mint. I love the Eliza J Belted Chiffon Maxi Dress! Thank you for the chance! I am loving the Eliza J Belted Chiffon Maxi Dress. There are so many pretty things. It was hard to choose just one but I really love the Beaded Halter Tiered Chiffon Gown. That would be so pretty to wear out on a date night. Love this beautiful dress! 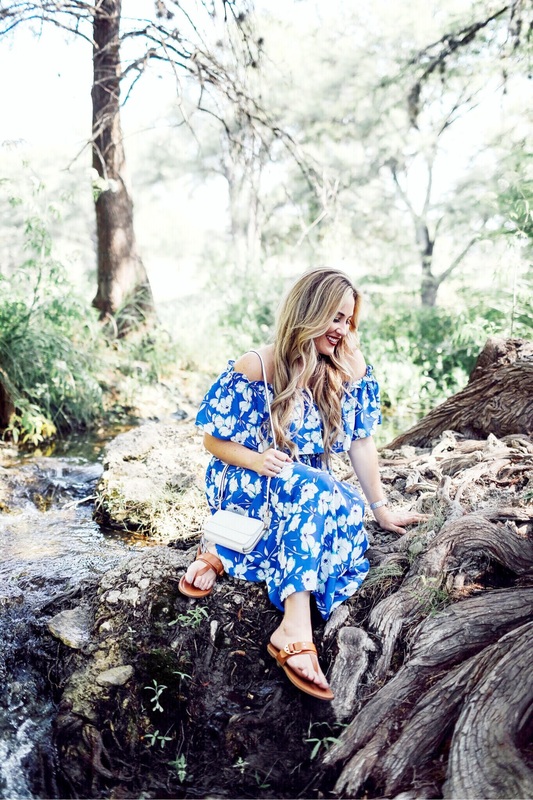 They have so many gorgeous options to choose from, but I think I love the plus size chiffon halter maxi dresses and the flutter sleeve fil coupe maxi dress! I love the polka dot dress! Eliza J Crochet Overlay Dress is my favorite! I love the embellished lace fit and flare! My favorite would be the ELIZA J Crochet Overlay Dress. I LOVE the floral dress your giving away. Thank you for the chance! What a gorgeous dress! The color is perfect ! The knot front off the shoulder gown is gorgeous! I love the Eliza J Stretch Crepe Sheath Dress! My favorite Eliza J item is the maxi dresses but I’m not sure which one I like better. I like the Lightweight Knitted Kimono, #8. My favorite is the Beaded Halter Tiered Chiffon Gown. Beautiful!